Medication against arachnoentomosis in dogs, cats, ferrets and ornamental rodents. Bars spray against fleas and ticks for rodents. Polyethylene bottles (100 ml and 200 ml) in cartons. Perfect for insecticidal acaricidal processing of both an animal and its inhabitation. The drug contains fipronil as an active ingredient. 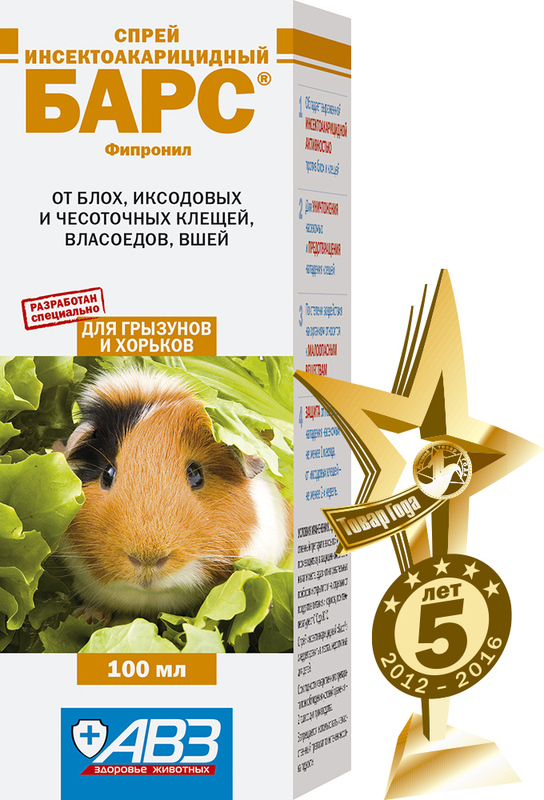 Fipronil provides frank contact and intestinal insecticidal acaricidal effect on larval and mature development phases of fleas, sucking lice, lice, ixodic and sarcoptic ticks parasitizing dogs, cats, ferrets and ornamental rodents. After spraying of animal pelage and skin fipronil gradually distributes along the body surface, slightly absorbs into systemic blood with further accumulation in animal epidermis, hair bulbs and sebaceous glands providing long-term contact insecticidal acaricidal effect. The drug provides protection from repeated insect and ixodic tick attack at least for 1 month and 2 weeks, respectively. Use for treatment of dogs, cats, ornamental ferrets, chinchillas, guinea pigs, rats and hamsters with entomosis (fleas, sucking lice and lice), sarcoptoidosis (sarcoptic mange, notoedrosis), сheiletiosis and ixodic ticks, as well as for prevention of ectoparasite attack. History of increased individual sensitivity to the drug components (including fipronil). Do not use in lactating, contagious and recovering animals. Do not use in pregnant and lactating females, kittens and puppies of dogs and ferrets under 10 weeks old, as well as in rodents under 2 weeks old. Administer on open air or in a well ventilated room with open windows (fanlights) far from open flame. Before use move away cages with ornamental birds and cover fish aquariums. Use muzzle, cervical collar or close animal jaws with a tape loop to prevent drug licking and remove it after complete drying of pelage and skin. Before use shake a bottle with the drug, hold it vertically and press dispensing pump. Keep aerosol flame 25-30 cm away from the surface to be sprayed. One click of dispensing pump is equal to 0.5 ml (200 ml bottle) and 0.25 ml (100 ml bottle). Spray all animal body contrary to hair growth slightly moisturizing hair to kill insects and prevent ixodic tick attack. Lift hair by hand when apply the drug on skin and hair base in long-haired animals. Administer in dose of 0.5-1.0 ml per 1 kg of body weight (depending on pelage status) by one and two clicks on dispensing pump, respectively. Shield animal eyes and process conches and thorax. Gently rub the drug around eyes and nose by finger tips in glove.Then process neck, body, limbs, abdomen and tail. Comb animal in 20 minutes after processing. Reprocessing: according to indications, no more than once a month (against insects) and once in 14 days (against ixodic ticks in parasitizing season). Prevention of flea reinvasion: process beddings, body clothes and other animal care items with spray (2 ml or 4 clicks on dispensing pump per 1 sq. m of surface to be sprayed). Do not allow animal contact with processed items within three days. Clean (or wash) them with a washing agent before the next use. Feline notoedrosis and canine sarcoptic mange: apply the drug to affected areas (previously cleaned from sloughs) engaging till 1 cm of frontier healthy skin (1 ml or two clicks on dispensing pump per 10 sq. cm of an affected area). Administer for 2-4 times, 7-10 days apart till animal clinical recovery confirmed by double negative result of acarological testings. Animals with major affected areas: process in two steps, 1 day apart applying the drug on the one affected half of the body and then on another one. Treatment of canine and feline ear mange (otoacariasis): clean external acoustic meatus from sloughs and crustings. Then aim aerosol flame to internal surface of conch, press dispensing pump once (or twice), middle animal conch and massage its base. Repeat processing for 2-3 times, 5-7 days apart. Process both ears, even where the only one is affected by otoacariasis. Otoacariasis complicated by otitis: administer antibacterial and anti-inflammatory drugs. Repeat treatment course, as appropriate. Ectoparasite affection in ornamental rodents: gradually apply the drug on pelage in following doses: hamsters - 0.25 ml per animal; chinchillas, guinea pigs and rats - 0.25 ml per 100 g of body weight. Adverse events and complications generally are not observed in case of administration as per package insert. In case of increased individual sensitivity to the drug active ingredients and allergic reactions, wash spray away with water and shampoo and stop further administration. Bars spray against fleas and ticks for rodents. Polyethylene bottles (100 ml and 200 ml) in cartons.